I'm taking part in an Open House on Friday and I have a couple sets of Halloween Clips to sell. This view is a far cry from what my desk looked like last week! But a few minutes and it would be back to looking like nothing was going on. You can see the edge of my Cricut and the far right, some small highlighters right next to it then some cards in front of a red box holding my acrylic blocks. Center bottom, my blue cleaning rag and clips sitting on some work paper. Top is a couple desk organizers holding required tools and my spray water bottle for cleaning stamps. Left bottom, my white basket of bottles of ink and Silks then my Ott Light. Behind that is my ink rack. And absolutely far right, unfinished projects and the end of my ATS adhesive roller. Our little Miss Piggy, a 15 1/2 year old manx, was put to sleep yesterday due to advancing kidney disease. She quit eating almost a week ago and I took her to the vet. Blood work was so sad. So Monday morning I made the call and at 10:50 yesterday morning we sent her over the Rainbow Bridge. She had lost more weight and was uncomfortable. She had moments of her old self but we were not willing to let her suffer. My hubby went with me and I held her as she passed. That was so so hard and we both cried. We had the vet make a paw plaque with her name. 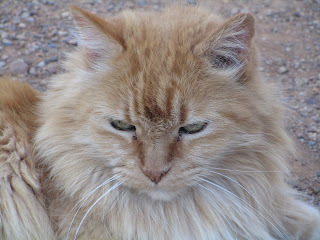 We brought her home and buried her next to our beloved Arlene cat that was put to sleep in 2009 from the same disease. 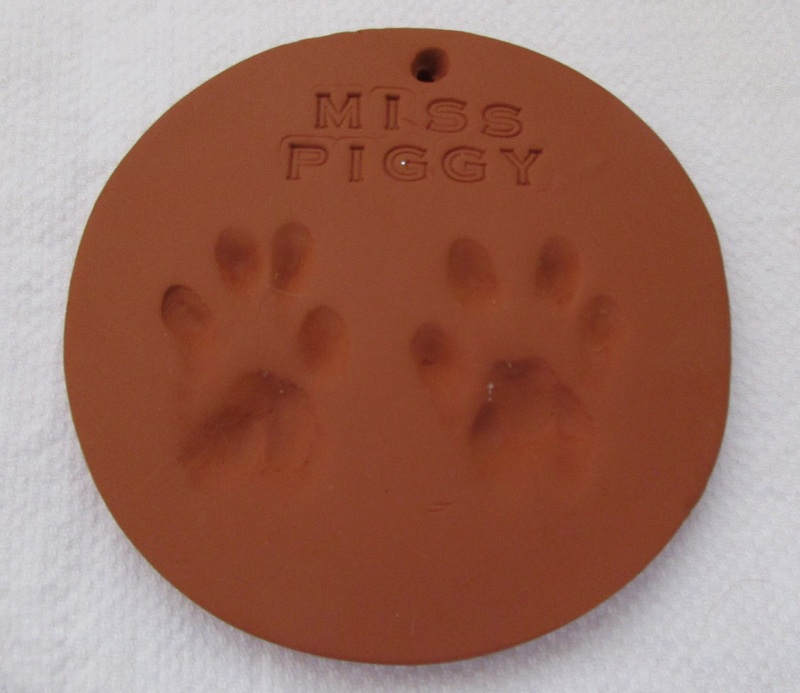 I will be looking to have a memorial made with Miss Piggy's name and her life span. She also had FIV but that was in such early stages it didn't affect her. I baked this plaque and when taking a picture I didn't notice the little white speck of something on her name. I'm also looking to get a nice frame for the head picture and a great photo of her before her passing. At this time we are taking a break from having a cat. This is the first time since we married 36 years ago we won't have a pet. Who knows someday. 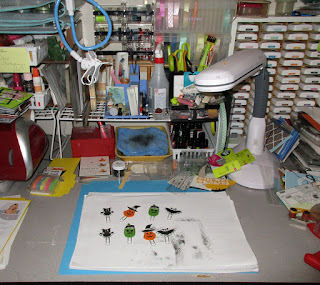 Anyway, head over to the Stamping Ground for links to other desks and crafters. You'll see some great projects! I am so sorry to hear about your lovely cat. They become family especially after being with you for so long. I hope you can find some solace in your crafts and with family. I'm so sorry to hear about your Miss Piggy. It sounds like she had a good life and you did the right thing by letting her go. Every cat I ever owned was special. I hope in time you can adopt another. I do believe we'll see our furry friends again in heaven.